A unique team building activity, offsite event, or DIY party! Want to get creative for your next team building event, offsite activity, or DIY party? 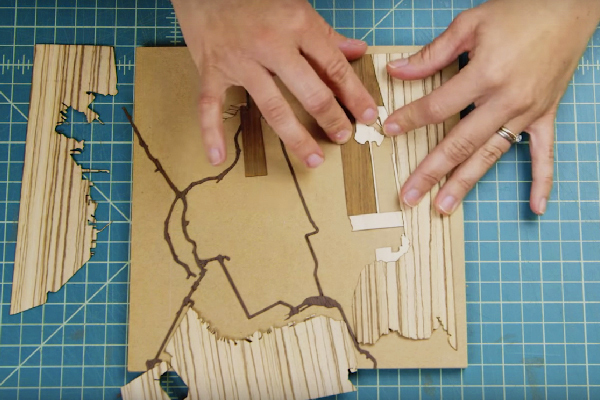 Have everyone design and make their own custom wood-inlay map! Woodcut Maps's workshops blend design, mapmaking, and woodworking for a memorable group experience! Now booking corporate team building workshops throughout the San Francisco Bay Area! "This was so fun! You get a really cool, custom finished project and it was affordable. I've done this both as a smaller class and for a team offsite. Highly recommend." Learn a New Skill, Share Stories, and Make Art Together! During this team building workshop, your group will learn the basics of wood marquetry, a centuries-old fine woodworking technique where wood veneers are used to create pictures. Woodcut Maps's dynamic hands-on studio approach makes every single person in the group feel like an accomplished designer and craftsperson. Under our instruction, the process itself is quite relaxing - many people tell us how meditative and surprisingly approachable the activity is! We love watching everyone share personal stories with each other about the locations of their maps and then beam with pride upon their final reveals. Much like how a map represents both the place and the memories, this creative team building workshop offers the best of both worlds: social experience and physical product. We Can Host You in The Mission or We Can Come To You! What You'll Pay & What You'll Get. We can accommodate group sizes of 6-40. The cost is $85 per person. Each attendee designs, makes, and leaves with their own custom 6x6 inch wood-inlay map of any place on earth. In advance of the workshop, participants submit their Location Selections via your group's form (sent after booking confirmation). Day-of, we will bring along a few basic San Francisco designs for any unexpected participants. Workshops last about 90 minutes (we need 30 minutes prior for setup and 10 minutes after for cleanup). The cost of the workshop includes all professional design fees, materials, instruction, and cleanup. "Catherine from Woodcut Maps came to our office in SF and facilitated a great team event! It was wonderful to have some social time with my colleagues, work with my hands, and then go home with a piece of art. Catherine was incredibly easy to coordinate with and super-responsive. Thanks, Catherine!" - Jennifer A., MicKinsey & Co.
Get to know Gabe and Catherine, the husband-and-wife team behind Woodcut Maps, and see the mapmaking process in action.